A day out shopping in Bath is heavenly, especially when it is combined with lunch and a film afterwards at the Odeon cinema. This photo shows us tucking into our starters at a Frankie and Benny's restaurant, sitting outside on the bonket seating in the covered atrium area, next to the cinema. 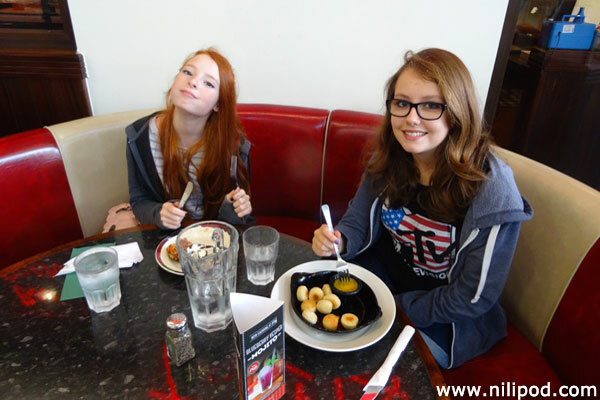 For starters, Nia had some yummy potato skins, which were filled with lots of cheese and crispy bacon pieces, while Liv had a huge plateful of garlic dough balls and quickly got stuffed when her margherita pizza arrived. Nia had a BBQ Philly Hotdog topped with a cheesy sauce, which was nothing short of delicious. Unfortunately, we ran out of time and didn't get the chance to have dessert, although I don't think we could have managed the chocolate cake anyway, as we'd both eaten so much and were pretty much fit to burst.